Ananya joined the Gold Star Staff in summer of 2016. She is currently a member of our Girls Artistic Optional Team and also competing for her high school gymnastics team. 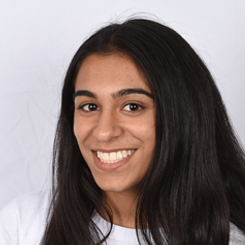 Ananya began gymnastics at GSG when she was six. She is has her USA Safety Certification, and because her favorite Disney movie is Lion King her dog’s name is Simba, after that brave little lion.